Drop rate is ridiculously low, I suggest buying it through the neutral Auction House if you are horde. Realm forums are useful in finding someone to put it up for a reasonable price. If you're looking to farm for this, I'd suggest 31.5 33.5 in westfall. There's plenty of defias there and they're on a quick respawn. They also happen to drop a lot of linen cloth which can sell for a bit. Have some open bag space! I was farming for Captain Sanders' Treasure Map in Westfall when this recipe dropped for me off a murloc. Killed two birds with one stone. Now Bind on Pickup as of 4.0.3a. This dropped for me off the Riverpaws in Westfall. Got it in 20 kills or so. I was also got Recipe: Westfall Stew, it might of taken 200 kills. I was in Westfall and farmed this + Recipe: Westfall Stew when I found an AWESOME spawn point. Its at 35.61, there are 3 gnolls that stands in a triangle. When you kill all three of them, they all respawn at the same time. I was there for about 15-20 minutes, and got both of the recipes. found it at the small gnoll camp between Sentinal Hill and Moonbrook, close to a small pond. 63,70 the dust plains - westfall. good for grinding this (horde) the gnolls have a fast respawn. Westfall (35.7, 61.4) drops you right in the middle of three Riverpaw Herbalist. Kill all three, zero second respawn. Grind it out till you get claw recipe. Took me about 10 minutes. 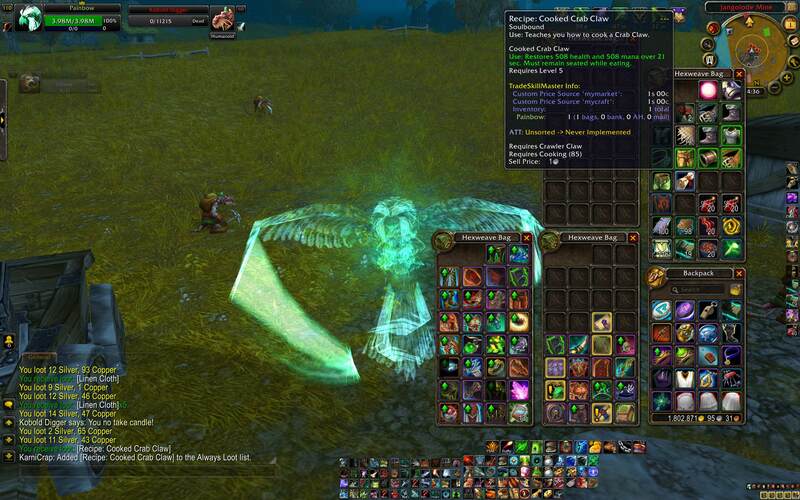 O MY GOD A BLOOD ELF FRIEND OF MINE GOT THE DROP! I didn't see it was Bind on Pickup, and seeing the droprates and the level 15 mob he looted it from...... Iron Chef: 183/200...... WAHHHH! EDIT: I just discovered a spot in Westfall, (a location already known to few), with a mob, I believe under the title of "...Riverpaw...". After you kill all 3 of them, they instantly respawn. I got the Mechanical Squirell Box Recipe, Recipe: Cooked Crab Claw, and the Westfall Stew Recipe, as well as green gear and gems/linen by the dozens. Great for proffessions, as far as disenchanting gear, you can use linen for numerous things like auctioning for profit or multiple professions, you can level off the "...Riverpaw..."s as they are level 12-13 and are easily killable. Also, the gems and recipes they drop may be useful. With the 2 cooking recipes, I got 2 recipes closer to the Cooking achievement, Iron Chef. They drop lower level gems such as Malachite, Tigerseye, and Shadowgems. I'll have to re-edit this comment to list the coordinates of the Riverpaws. I forgot the specific slash (/) command you can use to find out your coordinates, and I only use the TomTom addon for waypoints, but I'll give the simplistic coordinates for the area, from there you can try and "translate" it into either addon waypoints, or just by the slash (/) command, if I can find and post it. The 36,61 spot mentioned by many do not have instant respawns anymore in 4.3. I found another spot at 37,32 where there's 3 spawn spots, and any time you kill one there'll be an instant respawn at any of the spots. Took me roughly 5 minutes to pick up Cooked Crab Claw recipe and Westfall Stew recipe. as for 4.3.2 the new spawing point for those who have not coords is http://www.wowhead.com/maps?data=40:334687. When they stop spawning straight away, just kill 1-2 of those who spawned just a few yards away to make them respawn again. just dropped off a boar in westfall, level 15 , co ords 66.0 64.7 good luck. I found another spot where the Riverpaw Mongrels spawn quite a few and some of which respawn almost instantly. Coords of 34,26. The camp is on the cliff just above the shore in the NW. Got the recipe in like 2 sweeps of the area. The actual mongrel i killed I had to kill about 4 times. I just wanted to add that I found out I had missed Westfall Stew as well. It took anothe 1-2 minutes of about maybe 10 kills to get this recipe here in the same spot. It was a helpful hint that killing others a few yards away will help them respawn quickly! I got my recipe very, very fast from certain vultures, Greater Fleshrippers, in Westfall. Along the shore, at 26.6 / 42.8 (directly west from the Raging Chasm) there's a half-eaten corpse of a sea creature. There are always at least two vultures around it, as in one spawns as soon as there is only one left. Killing these vultures, I got my recipe in about six minutes, of which one or two was spent checking the comments and the Dropped By list here to see if the recipe would only drop from humanoids. If you are 85 and looking for this recipe I suggest Sentinel Hill. AOE the Riverpaws fighting the low level Sentinel Hill Guards. (You can do this at lower levels but a few of the guards are level 85). I stood there killing birds for 15 minutes, RSPB were threatening to ban me, but no recipes. Is this still viable after Pandaria? Landed in Westfall. Killed a Hulking Goretusk at 35.9, 80.9. Boom! - Cooked Crab Claw is on the menu! Dropped tonight (2018-03-01) in Westfall from a Kobold Digger at the Jangolode Mine. I was surprised I didn't have it! Learned it just fine. Use: Teaches you how to cook a Crab Claw. Use: Restores 272 health and 272 mana over 21 sec. Must remain seated while eating. This item can be fished in Westfall.